Crunch machines will vary in design (some may use weight plates while others may use weight stacks), some may offer various adjustments of seat height and ankle pad height. It is important to properly position the device to achieve maximum results. If possible, adjust the seat height so the back pad is positioned to contact the middle/lower portion of back. This should be below the shoulder blades but above pelvis. If possible, adjust the ankle pad height so the top of the feet can comfortably form a 90 degree angle against the ankle pad. With the body in the ready position and feet secured, reach behind and grab the support bars typically located above the head and slightly off to the sides. With a firm grip on the support bars, pull the chest down towards the knees. 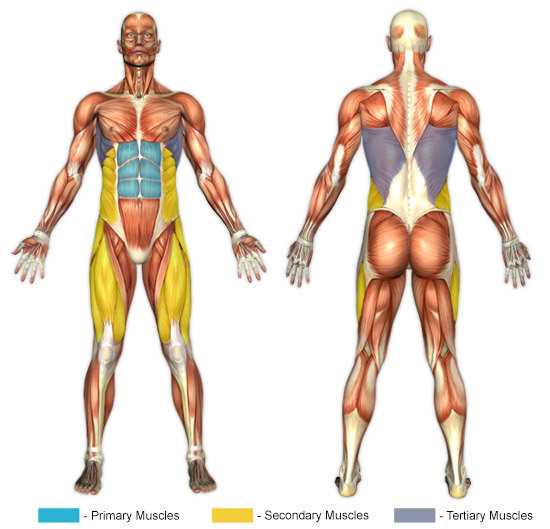 Imagine pushing the abdominals into the spine. Exhale throughout this motion. With the chest drawn as close to the knees as possible, slowly allow the weight to pull the body back to the starting position. Inhale throughout this motion. The quadriceps are brought into action during this exercise as they support the positioning of the ankles against the ankle pad, especially on the negative motion. While performing crunches on the machine, individuals may notice that the spine may arch when returning to the start position. If this occurs, be sure to keep the back firmly pressed against the pad to prevent discomfort or injury.